I LOVE Makeup Brushes. They are one of my obsessions, and I believe you can't have too many! I think I have close to 100, which I know is ridiculous, but I love them sooo much! I especially have a thing for eyeshadow and crease brushes, but I love them all. 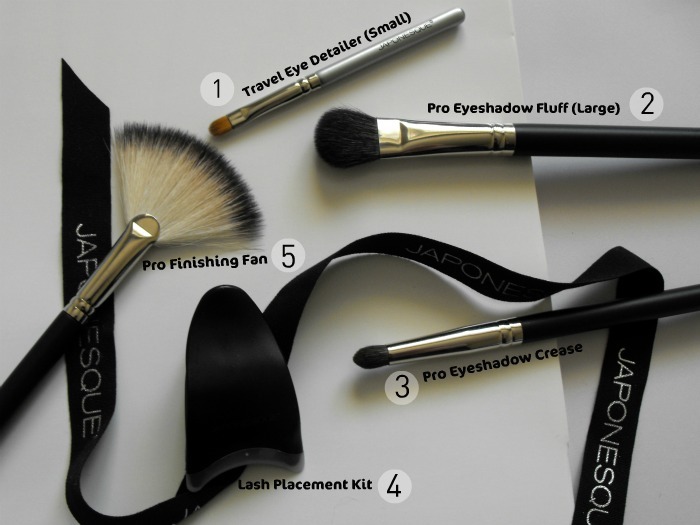 I have recently been playing with these lovely Japonesque Makeup Brushes*. I had never heard of the brand until quite recently when they were popping up on lots of blogs, after being made more available in Boots and John Lewis. Here are the brushes I have. 1. This brush is cute! The travel sizes have a reasonably lengthed handle that is easy enough to use. This brush is small, and I found that it worked well for lining the lower lash line. It's too small and stiff to lay colour down, but is great for smudging out liner. 2. Oh how I love this brush! It is large and fluffy, as the title suggests! It is great for a wash of colour on the lid, or my personal favourite, which is highlighting the brow bone. The soft bristles lay the colour down and blend it perfectly. This is also large enough for the face and I love it for highlighting my face too. 3. The crease brush! I told you I love crease brushes. This brush is soft, tapered to a perfect small point for precise crease work, and is lovely and dense, so it picks up just the right amount of colour. I am so happy to have this addition to my brush collection. 4. Hmm. The lash placement kit. What to say? .. I saw a review of this somewhere once where someone raved about it, and I really wanted to see how it performed. Now, I don't struggle with lashes that much, but any help is always welcome. I'll be honest, this was a fail for me, but I have seen so many positive reviews that I am not going to give up. I'll just practise more! 5. Believe it or not I do not own a fan brush, and never have. I really wanted one though, so was excite about this. The bristles are lovely and soft, and I love to use it for a light bronzer, blusher, or highlighting my cheeks. It's also great for sweeping away fallout from messy eye shadows. A lovely brush! I do have another brush which isn't photographed because it was dirty and I wanted them all clean for the picture. I will review it separately though, it is one of my faves of them all! So all in all I really like these brushes, they feel very sturdy and are high quality, they wash really well and I haven't experienced any shedding whatsoever with any of them either, which is always a good thing. It seems that Japonesque brushes are a little hard to find, but I am sure if you go into a larger boots store they will have a better selection than the website. Here are some of the places online where you can purchase them. John Lewis, Boots, Cocktail Cosmetics, Love Makeup.